One of our favorite ways to style an Anthony Vaccarello Lace Detail Wool Bomber Jacket is to team it with a black floral midi dress for a casual getup. Bump up the dressiness of this getup a bit by wearing black leather knee high boots. 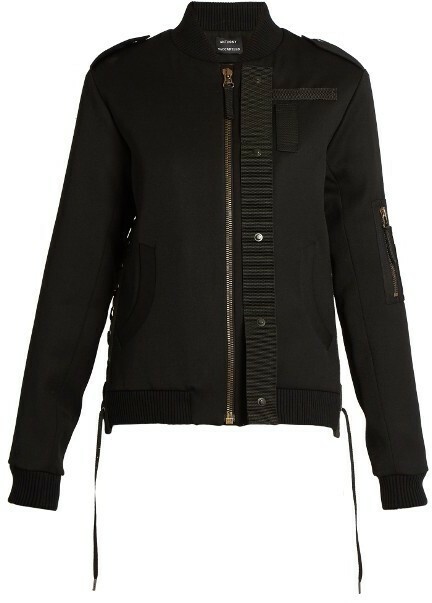 If you're on the hunt for an off-duty but also incredibly chic ensemble, pair an Anthony Vaccarello Lace Detail Wool Bomber Jacket from MATCHESFASHION.COM with black leather skinny jeans. Why not add black leather mid-calf boots to the equation for an extra dose of class?